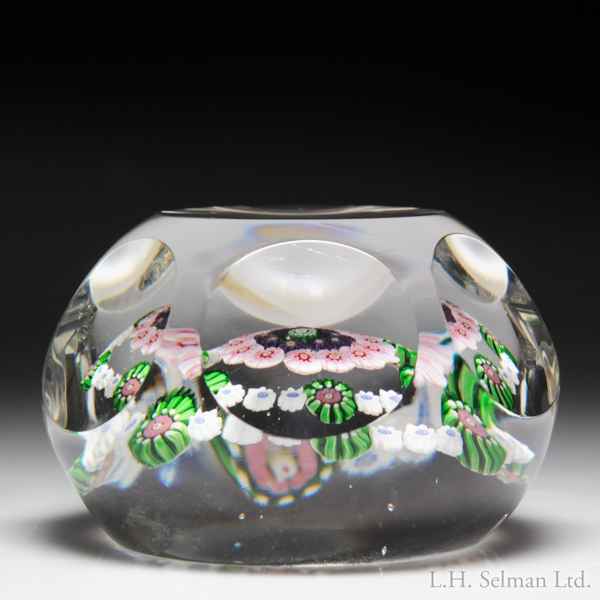 Antique Clichy faceted spaced concentric millefiori paperweight. A green and white cog cane at the center of the design is surrounded by a ring of purple and yellow pastry mold canes, then a ring of larger red and white pastry mold canes, and surrounded by an outer ring of pink and green complex canes alternating with trios of smaller blue and white pastry mold canes, on clear ground. Six and one facets. Diameter 2 5/8".